Tatanka, the Native American professional wrestler that graced the WWF ring throughout the early and mid 90s! What a presence, what strength, what a dedication to the art of fake fighting. 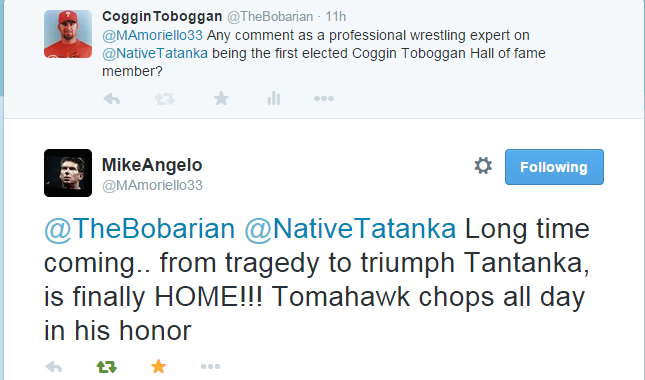 Yes, Tatanka truly deserves our respect. 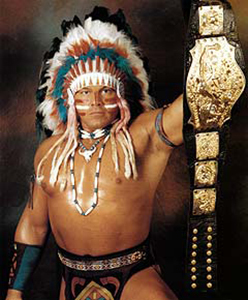 Born Christopher Chavis, Tatanka debuted in the WWF ring in 1992, defeating Pat Tanaka in his debut match. He would go on to amass an impressive undefeated streak of TWO years, before suffering his first loss at the hands of Ludvig Borga. Of course, one has to show a dedication to other things in life than sports. 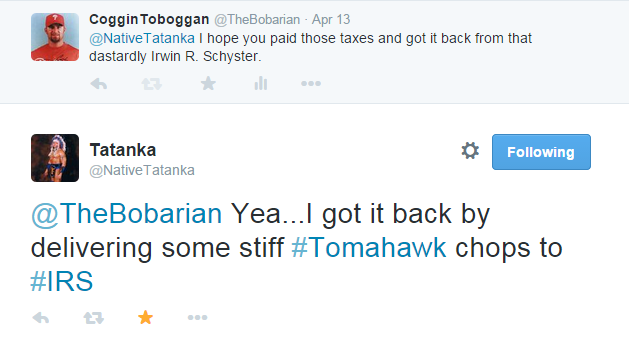 Tatanka caught our attention earlier this week as we tried to engage him on Twitter. 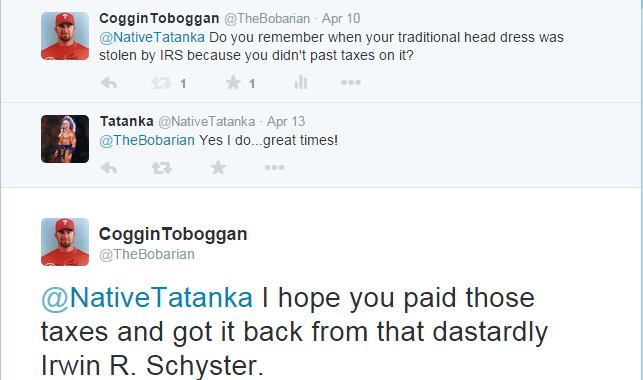 Being a gracious gentleman, he put up with our nonsense and seemed to enjoy reliving an EPIC feud he engaged in with the dastardly Irwin R. Schyster, who stole his ceremonial headdress because Tatanka’s ancestors failed to pay back taxes on the piece. Oh the Tomahawk Chop. One of the most devastating finishers in WWF/WWE history, do not confuse it with the nonsense that takes place in the Braves stadium. Upon being told he would be the first member of the Hall of Fame, he promptly retweeted the tweet, and I’m only guessing here, but he most likely performed a traditional war dance to the Lumbee Tribal War Cry around his computer in triumph. *Discount offer on merchandise not valid in the lower 48 states.